Location, Location, Location! Downtown Victoria waterfront condo. Beautiful new waterfront condo in the heart of old town Victoria, B.C., Canada. Close to all major attractions including the Parliament Buildings, the Empress Hotel, the Waterfront Causeway, Chinatown, restaurants, shopping and whale watching. Our Janion studio suite is the perfect location for visitors who want to explore the city and all that Victoria has to offer. Our suite includes a full kitchen, comfortable sleeping for 4, underground parking and spectacular views of the upper harbour. In the heart of downtown Victoria. Walking distance to all that the city has to offer. Beach view from our living room of the Upper Harbour in Victoria, B.C. Oceanfront view from our living room of the Upper Harbour in Victoria, B.C. Fantastic water views from our floor to ceiling windows surrounding our entire suite. Waterfront view from our living room of the Upper Harbour in Victoria, B.C. underground parking stall included with rental. 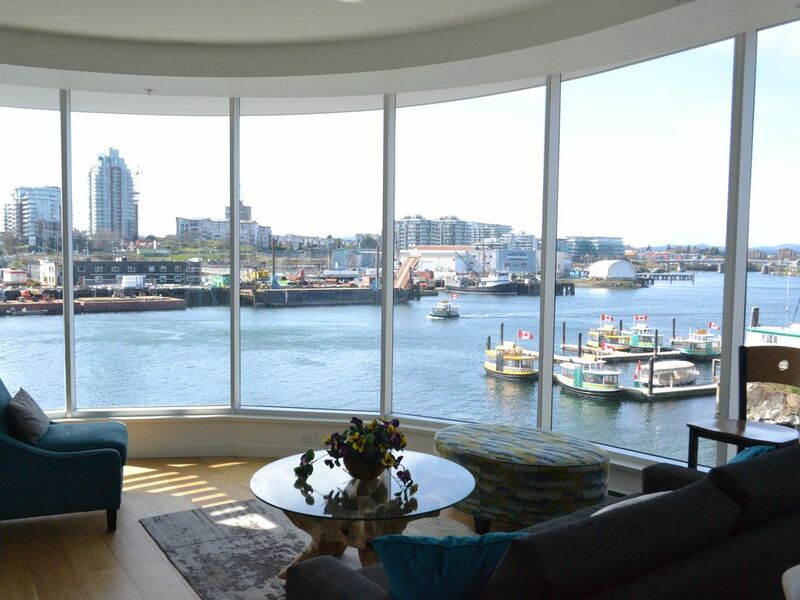 Wonderful location in downtown Victoria with a brilliant semi-circle of floor to ceiling windows providing stunning views of daily harbour life in Victoria. Paul and Karin are great hosts to deal with and were always there to answer any questions. We walked everywhere whether for coffee, dinner or sightseeing. I would highly recommend this unit...it was also impeccably clean! Although I can appreciate that this might not be the best rental for everyone, it was perfect for us and we would try to stay here again for future trips to Victoria. It is small but we thought it was wonderfully cozy. There is light coming in at night but we just used eye masks and slept like babies. The bed is very comfortable and you have everything you need in the apartment. The owners are great and thought of everything we needed. And the location is perfect - we walked all over Victoria during our stay because everything was conveniently located. Watching the traffic on the harbor was wonderful. We walked over the bridge and when we were on the other side, it had to be raised to let traffic through. We ate at Fish Hook one night, which was steps away and such good food. Overall, a great stay. Paul and Karin are great to work with. The best view of the harbour and location right in the heart of Victoria. I gave the homeless guy and his gorgeous dog that were camped outside $20. Definitely recommend! Our stay at the Janion Building was the perfect place for us during our trip to Victoria! Karin and Paul were gracious hosts and full of info on how to make our stay the best it could be. The condo is small but efficient. Extremely comfortable bed, great shower and bathroom and a view that is unbeatable. I will echo previous comments about the bright lights and needing an eyeshade, but I am sensitive to light and slept like a baby with a t shirt over my eyes. The location is quiet and walking distance to everything. We will be staying here again! Fabulous view and just right for the two of us. Loved the modern feel and ingenuity of maximized use of space. Really comfortable bed. The window shades are light filtering so you always have a view but also privacy when needed. That makes the room a bit bright at night, not a problem for us, but if you need inky blackness, bring your eye mask. Lovely walkable Victoria was right outside our door. Owners were great. Condo is in a perfect location. Everything is easily accessible by foot. The beds are extremely comfortable with good quality bedding and the whole condo feels luxurious. Very secure building with underground parking. Nothing but good things to say! Our waterfront condo in the heart of Old Town Victoria is located in walking distance from all major attractions in downtown Victoria. Minutes from fabulous local restaurants, we are steps away from Chinatown and Government Street shopping. Explore all that downtown Victoria has to offer. Secure, underground parking is included with the rental.